Tradition... that word has been tossed around quite a bit lately. It has been used as a crutch, it has been used as an excuse, it has been used as justification, but most disturbingly, it has been used a a distraction and diversion. Using the term in its real sense though, traditionally, Chinese people do not like to waste, and they especially do not waste when it comes to food. Anyone who has been to dim sum can attest to this. We offer things like tripe, pigs' knuckles, and chicken feet. Nothing is wasted. Absolutely nothing. This is what makes the "tradition" argument in support of shark fin soup so ludicrous. The demand for shark fin drives the practice of shark finning, which is arguably one of the most wasteful practices in which mankind has ever engaged. The irony slapped me in the face at a recent event held at the Monterey Bay Aquarium in celebration of sharks. 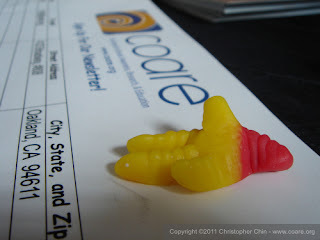 Those of you familiar with COARE's tabling efforts know that we often offer gummi sharks as a treat for those who stop by and engage in conversation with us about shark conservation. Since we were running low on supplies, one of our volunteers, Jilian, offered to procure additional gummis to replenish our "shark bowl". She returned with plenty of gummi sharks, but also brought back a small selection of other gummi shapes, including gummi worms, cola bottles, raspberries, and chicken feet. Yes, you read that correctly – gummi chicken feet. Earlier that morning, we were discussing distinctive chinese cuisine, (i.e., the "weird stuff" we eat), and how Chinese are, culturally, practically, and anecdotally, not wasteful. The aforementioned dim sum offerings entered the discussion that morning, so when Jilian discovered the chicken feet, she could not help but to buy a few to bring back. The fact that the chicken feet are so celebrated that they deserve their own gummi shape is very telling. . . and that is what prompted me to write this blog. We already covered most of the relevant issues regarding California's proposed shark fin ban (and dispelled opposition arguments) in a previous blog, and still feel strongly about all of those points. In that previous blog, I spoke of the two basic positions: people who understand the issues and support the bill, and those who do not yet understand the facts, the situation, or the consequences of shark fin soup. Basically, people who support the ban of shark fins, and people who do not YET support the ban of shark fins. It really is a "no-brainer" decision. I alluded to a third position – those who have a financial interest in the short-term slaughter of sharks and choose personal financial gain despite the societal and environmental costs In closing that blog posting I chose to remain optimistic in humanity indicated I would continue to lump that third category in with the second, considering them misinformed or misguided. It's become more apparent, with this fight, that greed and special interests play a larger role. Hiring two of the most high powered and influential lobby firms in the State to kill the shark fin bill is certainly not the work of mom-and-pop restaurants or concerned citizens; clearly, much is at stake for those profiteering from what amounts to the trade of endangered (and near endangered) species. What is particularly offensive to me, both as Chinese-American and as a reasonable person, is the use of cultural sensitivity as a distraction, and the use of fear as a tool to incite people towards opposition. Fear is a powerful tool and has been used for political, personal, and financial gain by infamous figures throughout history. Whether it's fear of economic collapse, xenophobia, or political or cultural oppression, fear has been used to rile and beguile unwary citizens into tacit and active participation in some of the most horrific campaigns in history, including widespread genocide. By suggesting to people (in this case, Chinese-Americans) that they are the target of a racial affront, it's natural that they will want to react negatively. This exploitation of fear is truly the only reason why some otherwise uninformed Chinese-Americans choose to oppose this measure. In reality, 70% of Chinese-Americans in California support a legislative ban on shark fins, according to a poll conducted by Fairbanks Maslin and commissioned by the Monterey Bay Aquarium.... and that poll was conducted before AB 376 was even introduced. Now that people know more about this bill, and now that even more people are aware of the issues surrounding the shark fin trade, that number would most certainly be higher. As far as the discrimination argument is concerned, common sense reflects the legal definition of discrimination, particularly with regard to law and established practice. AB 376 is not discriminatory because it does not affect Chinese or Chinese-Americans as a class. AB 376 merely asks to prohibit the trade and consumption of a luxury product. The fact that more Chinese-Americans consume shark fin than other ethnicities does not give a delicacy protected status. Moreover, only some Chinese-Americans consume shark fin, not the average Chinese-American, and certainly not on a regular basis. Prominent Chinese-American and Asian-American civil rights leaders also support the ban, and actually find offensive the use of cultural discrimination as an argument in opposition; if anything doing so trivializes civil rights matters of real significance, and "crying wolf" is not a game to play with civil rights. This is a really simple matter, and the vote truly is a "no-brainer", but special interests and powerful lobby firms are attempting to sway our lawmakers. What helps make a difference for legislators is hearing from their constituents.